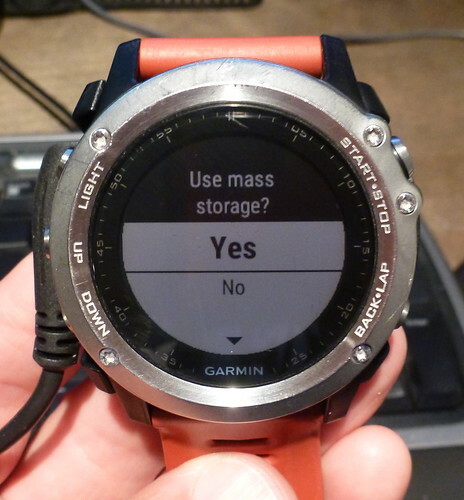 By default the fenix 3 is set to "Mass Storage" mode. This means that when you connect your watch to a computer via the USB charging cradle it will be treated like any other USB storage device and you can browse the contents of your watch from your computer. And of course your watch will also get charged while it is connected. If you change this setting to "Garmin" mode you will get prompted to enable Mass Storage mode every time your watch is connected to the charging cradle. All you need to do is say "No" and your watch will get charged while it keeps on recording your activity. So why not always leave your watch in Garmin mode? Garmin Express can't see or sync your watch when it's in Garmin mode. The advantage to selecting Mass Storage is you don't need to press two buttons to enable Mass Storage every time you connect your watch to your computer. Of course you can still sync activities by using the Garmin Connect Mobile app on your phone and pairing your phone with your watch and you can install some updates via Wi-Fi but if you want to update apps that you have installed on your fenix 3, you need Garmin Express. Thanks for your useful advice, I did everything like you wrote and it all works perfectly. If you dont mind I will share your advice to my friends, cause we very love to cycle together! Also we love sailing together, and for this purposes we use free tracking software https://uboro.io/ that helps us a lot. @Katty Black - please feel free to share this with anyone you like! I'm glad you found this post useful. This is an excellent list of programs that I have used almost all of them, but personally I would also add here one of the best Hoverwatch phone tracker that I have ever used because this soft have helped me a lot.